Honda Bringing Revised 2017 CB1100 EX to U.S.
December 9, 2016 – TORRANCE, Calif. Since 1959, when they first adorned the twin-cylinder CB92 Benly, the letters CB have always meant a great deal to Honda and Honda owners. They came to mean even more in 1969, as the four-cylinder CB750 represented a seminal moment for motorcycling, as the world’s first production superbike took center stage, laying down a blueprint that still stands today. Wow my Dad will be so excited ! He has been dead for 20 years. It has been my thought for quite some time, long before this CB came out, that if Honda brought back the ’81 Cb900F Super Sport, carbs, bias tires and all, I’d buy it. Loved that bike. Other than styling and some other minor differences, that’s exactly what Honda did with the ’13 CB1100F. It feels very similar. Weight, horsepower, seating position, performance are all very close. I’ve owned 5 F models and the ’81 was my favorite. Someone in an earlier post mentioned the styling. This bike has some similarities with early CBs was you would expect. 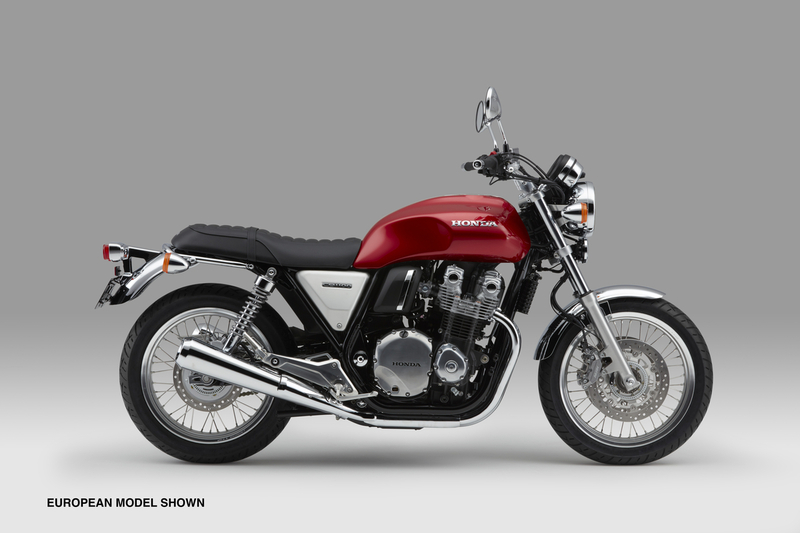 But the ’13-14 F model bear a striking resemblance to the 1975-76 CB400F Super Sport. Including the side covers being a different color than the tank. I would also like to see a Super Sport model like someone else mentioned. But I could dod with an RS model in a pinch. If Honda brings it, I’m buying it. If I have heard it once, I have heard it 100 times, the bike that people most regret getting rid of and the one that they miss the most is the CB900F. Man, people really loved that motorcycle. Mickey you’re absolutely correct. And I was fortunate to have two of them. My favorite ’81 model in silver and black ’82. My ’13 model is going nowhere. How about bringing the RS version to the states?? THAT retro bike is something I could see myself riding. They should badge it as a 750, then everyone would be happy about the power. Hondas always have a premium price that wouldn’t be noticed. A very well thought out refined design that checks all the retro boxes for me except….it just seems to be painted with the dull brush. Example, I was just looking at the Triumph T120 in a candy apple metallic paint with nice chrome where it should be. Now that’s a beautiful bike. If the Honda had more exciting paint (including the grey cover plate) and real chrome wheels, it would be getting there. It needs to move up a level. Random thoughts Re. Honda’s series of mid-2000s CB1100 retro bikes. The CB1100’s motor descends from the 4-V DOHC 4-V series introduced in the 1979 CB750, which came in SS and Standard “K” models like the original a decade earlier (forgot which years Honda sold the stylized “Nighthawk” versions). 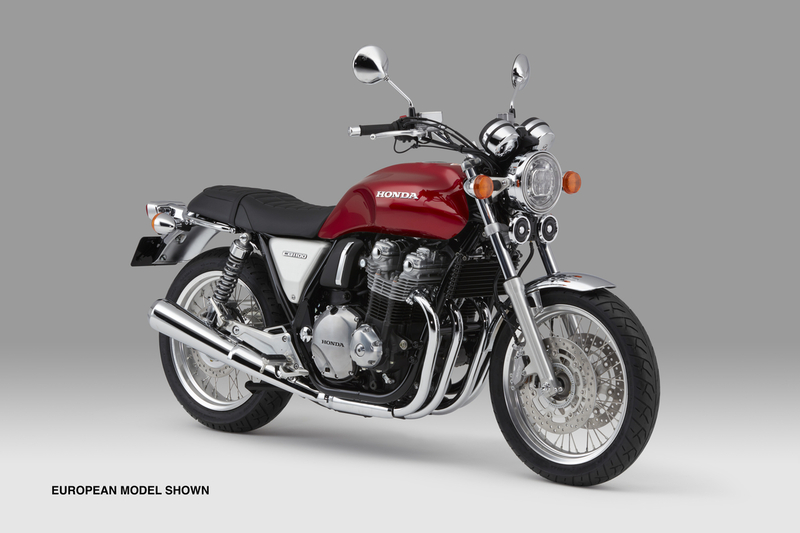 Conversely, the overall cosmetic design of the modern CB1100 is more like the original 1969 CB750K SOHC. Compare the ’69 CB750K SOHC 2-V vs. ’79 CB750K DOHC 4-V. They look quite different. One of the biggest cosmetic differences is the cylinder heads. Purely for overall cosmetic design, I prefer the ’69 over the CB1100 retro. Do a Google image search and you’ll see CB1100’s modified w/paint and graphics that better mimic the ’69. Performance wise, a stock ’79-’82 CB750SS absolutely annihilates any ’69-’78 CB750 SOHC. I owned both the ’77 CB750K SOHC and ’81 CB750SS, the latter likely being the best handling bike of its genre. The latter bike totally stomps and walks away from any stock prior/same vintage K model. In fact, between an ’81 CB750SS and the modern CB1100 retro, through a moderately tight canyon, IMO the former would walk away from the latter. IMO, any/all Triumph retros are more true to the classic, original cosmetics than the modern CB1100 is true to the ’69 CB750K. Honda had two alternate choices, both more attractive than the current bike. One option is for the modern CB1100 to more closely mimic the cosmetics of the original ’69 CB750K. In that vein, it might be better if the motor displaced 750cc, the “CB750K” nomenclature then evoking more pure ’69 nostalgia. I think this is where the CB1100 suffers. First, it’s an 1100 copying an era that had none. Second, the DOHC motor and the graphics are too different from the original ’69. It fails from these two views. From ’79 to ’83 Honda made SS models in 750, 900, and 1100cc. They all looked great. My personal preference is for Honda’s modern retro to more closely mimic any of the above SS models rather than the early K model. I suspect I’d prefer the 750cc engine, for less curb weight and less reciprocating mass. Beyond their SS nomenclature, all the above bikes were jewels among UJM’s, w/flat, usable seats, fantastic performance, and easily tailored/modified for any rider and/or modern use except winning races against modern race replicas. In their era, these bikes were among the most highly evolved and highest performing UJMs. I ‘d prefer modern upgrades like ABS, USD forks, radial front calipers, and certainly as much power as Honda could squeeze while passing emissions laws. The USD forks would look appropriate on a retro SS. Each year, Honda could copy the paint and graphics from a different vintage and/or engine displacement. They all looked to die for, my favorites likely being…well, any of them! Styling choices are all relative. I believe most folk’s opinions are biased upon what era they grew up with. Older folks may long for a K bike. I’d like to see a ’79 CBX style (not the 1/2 fairing things with side bags). As a kid My favorite bikes were the KZ1000R, which was later retro ZRX, and the Ducati F1. I think the CB1100 is a nice retro standard that I would enjoy. I’d consider this bike along with the ThruxtonR. Too many naked superbikes today, so I am glad to see the “standard” bike being supported. I wish I could add another bike or two to my stable right now. Riding anything is better than nothing. I think too many folks forget that sometimes. Not to mention making a DCT version, as well. I would definitely buy in that case. Honda’s previous attempt at an automatic CB (CB750A “Hondamatic”) was a complete failure. I doubt they want to repeat that expensive mistake. Honda Motor Co. chief Takanobu Ito used a street model to gain access to quake-affected factories. After the March 11 disasters, highways were closed and many roads were severed by the impact of the earthquake. But the man who runs Honda Motor Co. needed to get to Honda plants at Tochigi, about 100 kilometers north of Tokyo, as quickly as possible — a 43-year-old male employee died when the wall of a cafeteria crumbled, and 17 other Honda employees were injured at one of the company’s most important sites. So Takanobu Ito, the top executive at the world’s biggest motorcycle maker by volume, took to his Honda CB1100 “naked” motorbike two days after the quake to get to the Tochigi facilities, a vehicle research center, a manufacturing-technology development subsidiary and a component factory. The CB1100 is a company mainstay, the “naked” version carrying no fancy frills. The 57-year-old executive said he first drove a Honda car from Tokyo to his house in Utsunomiya, in the same prefecture as Tochigi, taking back roads with the highway network from the capital closed. The CEO then changed to the still brand-new motorbike he bought last spring to approach the quake-hit area. The pearl white 1100cc-engine CB was able to roll through disrupted roads around the facilities that a car would find it hard to navigate, he said. Reading your post, I see no mention of it, but what makes you think the CEO of Honda actually had to come out of his own pocket for a Honda motorcycle? Most responsible companies have books and ledgers. No doubt he didn’t have to pay MSRP for it :)… but just “acquiring” a unit is tantamount to theft. Yep, I missed that bit of the story. In all fairness he is 57 which puts him smack dab in the demographic ( 50-60 year olds) that this type of bike was made to appeal to. I imagine as a lad of 9 or 10 he was quite impressed with the new inline 4 cyl Honda that would go on to set the standard for the rest of the world for many years to come. I’ve read somewhere the man himself pushed and gave a go to the bike project. It was heavily discounted because of low sales. I really love standard style motorcycles, but I am confused on one point. I rode a 1983 CB1100F for 11 years. Why can’t a 2017 version have a least equal (if not better) performance? That’s the only reason these bikes seem to sit. Triumph gets it, even the air cooled version of the new Bonnie would outperform the original and those new water cooled units are going to sell like crazy. Honda has a great history but they just don’t know how to exploit it. The CB1100F of 1983 made 108 hp, but didn’t have to go thru any epa mandates. It also weighed more than the 2017 model and had a slightly larger motor. Also Honda had no plans to compete with the 83 CB1100. The new CB1100 does make 20 horsepower more than the 750 Honda did when it came out. Performance is more than hp/cc. It is very likely that this engine performs better than the 83’s in every other way, especially at the RPM levels where most of this bike’s owners typically ride. That almost-flat seat looks beeah’chun! Another looming sales flop. Styling took a serious turn for the worse. Performance barely increased. Dealers still have leftovers in stock from 2 or 3 years ago. Seems like they did a half-hearted effort to get leftover parts out of the warehouse. This demographic from 50-60 are buying and riding Harleys as one can see on the highways and byways of America. In its day, it was smooth and fast. There are now other smooth and fast bikes these days. It also flopped in the mid 70s along with the economy. And it flopped again in the early 80s after two years. The “OLD” engineers and project leaders deliberately chose torque over power. Older guys were/are killing themselves on big high powered bikes, even the ZRX1200 left many a widow. The idea is to slow down and enjoy the scenery and the ride, which this bike does. It’s not about race tech this and high powered that. Do we REALLY want to scream along on a tube frame with conventional forks and shocks? A 60 something friend just buys a crotch rocket for that, and loves it, for that. Finally, look at the highways. We are all driving CARS. CARS and more CARS. People don’t ride. And now people ride even less because everyone is texting like the lady next to me who looked at her phone 90% of the time! At last a major manufacturer realizes that hideous ugly tank seams are such an aesthetic blight that they should be forever banished from motorcycle designs. I am sure the original sketch did not include such warts. Let this be the beginning of the end of the seam, and let other makers understand that bike riders (and more importantly, owners) are not delinquent teenagers obsessed with cartoon images or Japanese manga style. This CB1100 is a clean machine, and looks far better than the CB750 original. I must admit that whirring metal, unimpeded by a liquid jacket, has a sound all of its own that appeals immensely. This one looks worthy. I honestly can’t tell you if any of my nine bikes have tank seams or not without walking out to the garage. Oh wait, I remember my ’93 Ducati Monster has a tank seam, the little tank prop rod engages with the seam to hold it up. That’s one of the best looking tanks I’ve ever seen on a motorcycle. Come to think of it, my GB500 has tank seams – I’m pretty sure. That’s definitely a contender in the Best Looking Motorcycle Fuel Tank competition. I’d say, to most “die-hard, born in the wool, motorcyclists”, tank seams don’t even show up on the radar. I’m with you…have never understood the whole tank seam thing. I mean, BFD. I totally agree, tank seams NEVER come into the equation when I’m considering a purchase. Makes no difference whatsoever. How badly EPA’d is this thing? Old design + old technologies and many get excited about the perspective of paying to pay today’s dollars for it! Those CEOs must be laughing their heads off! When the bike first came out, Honda claimed they’d done a significant redesign of the traditional UJM motor to suit modern legislative requirements, so I don’t think they just raided the back catalogue. My guess is this handsome machine is head-and-shoulders above the ‘original’ in all departments; not that I’ve ever found fours to my personal taste. Well, retro is a thing. A big thing. Customers want it and are willing to pay for it. Triumph gets over 50% of its sales from its modern classic line. If you go on Honda’s global site and read the story of how difficult it was to bring the CB1100 to production in 2013 you’ll understand why it costs over $10k. It’s more modern and unique than you might think. So a 40hp single cylinder BSA 500 Goldstar could do 95mph in 1963. That bike sold for $985 dollars in 1963, which was a LOT of money considering what the average worker was paid in 1963. In today’s near worthless dollars that would be about $7,880.00, not such a big deal really when you look at what the average worker is paid today. Good collectors copies will run from about $12,000 to $20,000, but you will still own an old 40hp motorcycle. Sure, its fun to show and ride a bit, but you had better be very careful with it, too. Or, you can pay around $10,000.00 for the CB1100 and have a much, much better motorcycle. High performance machines have NEVER been cheaper. The problem with most people is that unlike the people in 1963, we don’t just want the new motorcycle, … we also want every other new gadget on the market as well, which eats up disposable income and gives the impression that new bikes are more expensive. Be smart with your money and you can ride a much superior motorcycle than what your father or grandfather could for less labor. What! No tank seams? How did they think of that? When the new Bonneville T-120 came out last year, I had placed an order and it showed up as the first one for sale in the country. But the tank seam was so hideous. It belied the line that Triumph was pursuing the look of the original. I passed. This one looks a little more, um, … curvaceous. You based a $12K motorcycle purchase entirely on the question of whether or not it had a visible tank seam? Around here, that’s par for the course. I’ve never seen a group of “motorcyclists” who were so determined to come up with reasons NOT to buy a motorcycle. I work in the MC business and listened to hundreds of posers say how wonderful a bike is, but… Of course the only truthful answer, that is seldom admitted, is they can’t afford it. The original Bonneville had a tank seam. An ugly one, right down the center of the tank. Find another reason not to buy a Triumph. Actually, the switch gear felt really cheap, too. I test rode it and I didn’t really like the it that much. My brother bought a T-120. His only complaint is the pointy turn signal switch knob that hurts your thumb when you push to cancel the Tuurn signals. Other than that he loves it. Gorgeous bike, no doubt. I’ve ridden one of the previous model, the engine is super smooth but does not wow you with power. Not sure why with an 1100cc inline 4 Honda doesn’t get more out of it, I’m sure tuners do. I’d need a windscreen, but that’s it. My first thought are emissions coming from an air-cooled mill that can’t be controlled close enough temperature-wise to meet regs. It was a choice. You can read in the article that Mickey had posted that the engineers wanted 100 hp but the project lead decided it should only have 80. Because he didn’t need more. The wanker. That may be overly distilled. They were after a particular character, involving a mellow rumbling feel at lower rpm cruising speeds, which they would have probably lost by reaching for more HP. For the guys who like this bike, they seem to agree that Honda nailed it. They don’t care about a cc/hp ratio, only that the bike rides the way they like it. Truimph is doing the same thing with their revised twin. HD has had their finger on this pulse throughout their whole history. The difference is, HD and Triumph aren’t losing sales because of it. In the case of the CB1100, Honda is most definitely losing sales as a result of the overly anemic motor. Are they not selling, or are they simply recovering from an optimistic forecast? And if so, are we sure that’s the reason? Is the new Bonneville selling that well, or is supply low? Dave, no one can really say for sure either way except Honda and they don’t release that kind of info. We have no idea how many they wanted to sell, how many they projected to sell, or how many they did sell. THere are leftovers but there are left overs of about every brand and model. So it’s hard to say. On the US CB forum we have about 3000 members world wide from22 countries, plus there is a Korean CB 1100 forum and a German CB1100 forum and a French CB 1100 forum, and a UK CB 1100 forum. But I have asked Honda these questions, and how many of each iteration were produced etc etc and they just won’t divulge that info so it’s anybody’s guess. 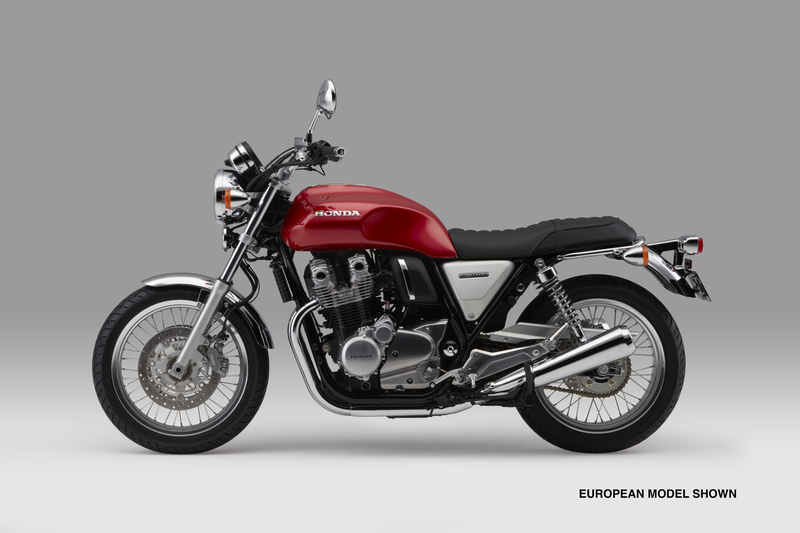 The CB 1100 is in it’s 8th year of production so they must be somewhat pleased with the acceptance world wide.